The South African–born founder of Tesla and SpaceX has agreed to let me follow him around for 24 hours and observe his daily routine. It’s only the morning and I am already sensing that it is going to be difficult to keep up with him. Since I’ve sat down, he’s had two more ideas for game-changing technologies: one, a swear word that can be used in space, and the other, a red car. He shouts these ideas into the ear of an old, tuxedoed gentleman who is standing behind him. It’s clear that Musk cherishes this part of the day—the time he reserves for idea generation. He screams an idea into Notebook’s ear about a spaceship that runs on yawns and the old man’s nose begins to bleed. 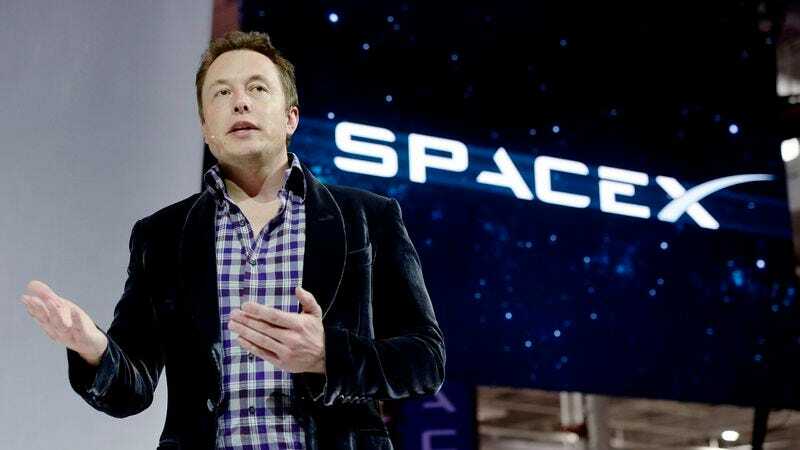 Musk’s obsession with space may seem like the flight of fancy of a billionaire with an overactive imagination, but, as he reminds me, space has informed his creative vision going all the way back to when he co-founded PayPal in 1998. What can you do? Well, here’s what Musk did: He took his money from the PayPal sale and funneled it into two companies that would make him synonymous with the words “expensive” and “thing”: Tesla Motors and SpaceX. The waiter comes by and Musk tells him that he wants to shoot him into space. An alarm goes off on Musk’s phone. It’s eight o’clock. “Time to go to work,” he says. And we’re off. I’m in Elon Musk’s Tesla on the way to SpaceX headquarters. We take the 405, and he shows me his favorite feature of the electric car that made him famous. “Oh, definitely,” a disembodied British voice instantly responds through the state-of-the-art sound system. Musk smiles like a proud father. This is exactly the kind of bold claim Musk is famous for. In a recent speech at the Innovation Summit in Prague, he ruffled the feathers of other automakers by promising that Tesla would one day build a car that was capable of not believing in God. Musk knows that he’s not making any friends when he says things like this. But he also doesn’t seem to care. “Is space pretty good?” asks the device. “Okay,” it replies. The doors swing open. The main room at SpaceX is extremely large and resembles an airplane hangar. Engineers in lab coats scuttle this way and that, tinkering with rockets and testing equipment. Almost immediately, one of them approaches Musk and asks him for some advice regarding a new project. Musk studies the data on the engineer’s chart. Even though he’s the CEO, you can tell this is still the part of the job he loves the most: looking at a thing for a long time and then saying something about it. The room erupts in uproarious applause. It’s the most intelligent thing anyone there has ever heard, and we’re all completely blown away. I’m tempted to call my mother and tell her about it, but I just leave a voicemail instead. It’s the longest voicemail I’ve ever left. Musk is then asked to observe a test run of an experimental project the company has been developing. We are led to a fenced-off launchpad just outside the building. In the center of the launch area stands a small, emaciated woman who is pointing at things and saying that she hates them. Musk explains to me that this is Mad Gladys. A technician uses a forklift to drop a satellite at her feet. She picks it up and inspects it. “What’s this? Another thing I hate?” screams Mad Gladys, flinging the four-ton satellite into space in disgust. “I hated that thing and I am glad it is in space.” The crew celebrates another successful launch. Musk spends the rest of his day handing things to Mad Gladys and watching her throw them into space. Several geodes. A blank CD. Four extremely skilled locksmiths. All of these things are sent hurtling into the void. Notebook passes out from loss of blood and Musk asks me what time it is. Six o’clock. Time to go home. Upon entering Elon Musk’s home, I immediately find myself in what appears to be a museum devoted to the Iron Man films. An animatronic Robert Downey Jr. screams the phrase “I am based on the body of Elon Musk” in my face and then begs me to tell him where the real Robert Downey Jr. lives. I confirm that I have seen the film Iron Man. Musk leads me into his elegantly decorated living room and we sit down on the couch. He sends another email to every single American that says “just a reminder about space.” Even out of the office, the work of the billionaire technologist is never done. He shouts an idea into Notebook’s ear about a spaceship that can be legally adopted and the old man immediately dies. Musk stoically cradles him in his arms. Suddenly, a gigantic hamster ball filled with Musk’s wife and children comes rolling into the room. Musk smiles. Watching Musk join his family inside Family Ball, I see him in a new light. After spending all day as the architect of our future, he becomes someone quite different when he returns home: a family man. The Musk family rolls around the room in their ball, smashing into walls and accidentally flattening Notebook’s lifeless body. As I leave through the front door, Musk screams something at me. It’s a little muffled, but I’m pretty sure he’s saying that he wants to shoot me into space. And I believe him. I really do.